Personalized gift for the bride and groom! High Quality material with many item and ink colors options. A Wide Selection of Clipart for your Coolies! If you’re looking for a unique way to personalize a event, baby shower, anniversary or birthday party, give out koozies as party favors. Koozies are affordable and ship quickly. If you’re not the kind of person who plans ahead, you don’t have to stress about ordering your favors ahead of time. You can get your koozies at the last minute and still be prepared for your party. Our clipart gallery is loaded with a wide variety of fun sayings and cute quotes. If you don't find what you're looking for our designers will help you design your coolies free of charge! 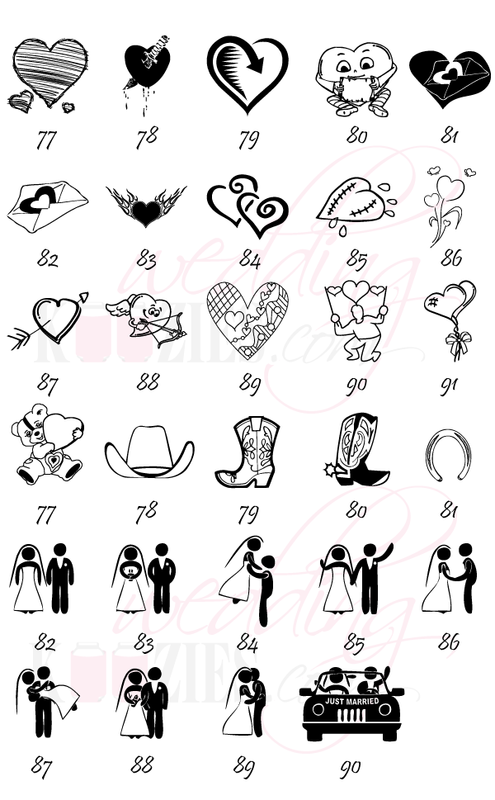 View our Entire Clipart Gallery of over 200 images! Just wanted to say THANK YOU for a great job on the coolies and the quick delivery. You have been great. I actually got the name of your company through a gal I work with who ordered your coolie for her wedding. Thank you SOOO much!! They arrived today! Y'all are lifesavers! Please pass along to Jay my many thanks! Thank you so much for all the extra time you've taken with my order. KooziesOnline.com understands that one of the deciding factors in selecting your vendor for your coolies is making sure that they have the clipart you want! This is why we try to offer an extensive selection of clipart for you to choose from. We also offer expert design service at no additional costs. Copyright © 2016 Koozies Online.com. All Rights Reserved.